Unlike most people, I have a short bucket list. There are a few items on the list I have already ticked off. There are a few I will get done soon. Then, there are those “must dos” that I simply did not think through. One of my big bucket list items was trekking to see the Mountain Gorillas in Uganda. I have been telling everyone for several years I was going to do it. So this past summer I did it. Before I knew it, I was in Uganda on my Mountain Gorilla quest. It was the hardest thing I have ever done in my life. It was also the most rewarding and humbling experience. As I trekked up steep cliffs, through tea plantations and into thick heavy forest I had no idea how deeply the experience would change my life. That is until the moment that I finally laid eyes on the troop of Mountain Gorillas. However, little did I know I would be so tired from the trek that I would nearly skid down the hill and into a Silverback’s lap. To note, that little slip up is in no way is a reason not to take this incredible journey. In fact, that was what made my personal quest to see these amazing creatures all the more special. You work for it, but it will be an encounter you will never forget. For Mountain Gorilla newbies, the Silverback is the term for the big male in the troop who runs the show. In other words, he is the alpha. He is as gentle as he is strong and it will bring tears to your eyes when you see the troop interacting. The troop I saw was the Kisaro family with 19 babies. Those babies are certainly amusing to watch. Avoiding a fall into the lap of the Silverback or other family members, I found myself hanging onto nearby branches. Upon recollection, I’m not sure of their soundness. I just stood there staring in wide-eyed wonder. Not even considering that if the branches broke I would probably end up broken too. The word giddy came to my mind when I arrived. Just steps away the troop of about 20 were playing in the trees and having a snack. When you finally arrive near the gorillas I was told, you will smell them before you see them. That was true. There were flies everywhere so you can’t miss that either. You can trek anywhere from 30 minutes to nine hours to see the troop, the trackers usually have a good idea of where they are each day. We were so lucky that it only took us about three hours. We were then afforded the opportunity to stay and observe them for one hour – that’s the visitors limit. What an experience! I felt a strong giddiness. 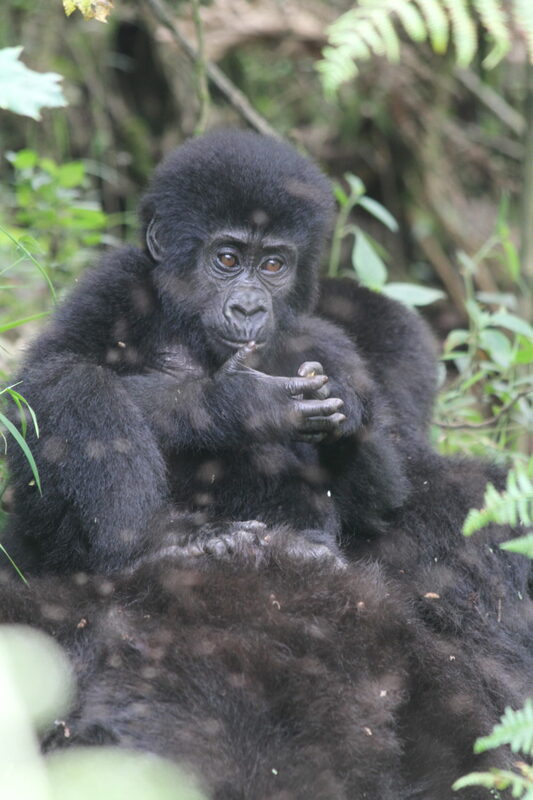 Really words can’t describe the giddiness of watching a baby Mountain Gorilla interact with its mother and the other members of the troop in the trees. It’s like watching a family and peeking into their way of life. there are likely only about 800 living, which is tragic. This was caused by poaching, habitat loss and wars in the area in which they live. The most recent reason is encroaching on the Mountain Gorilla habitat by civil unrest and displaced refugees. You can bet when visiting it will touch your soul. As for the actual guidelines of trekking there is a limit as to how many folks can trek to see the gorillas per day and we were told that number is eight. I highly recommend visiting the gorillas with Journeys Discovering Africa – owner, Patrick Shah makes sure that not only all your needs are met, but then some. Even with all my travels, I can say there are only a handful of times in my life when I know I have lived beyond the means of expectation. Watching the Mountain Gorillas in their habit in the Bwindi Impenetrable National Park in Uganda ranks as high as anything I have ever done. 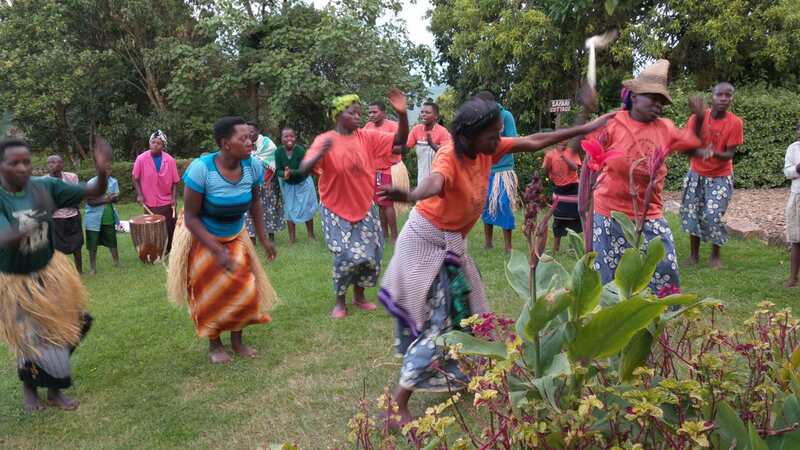 Bwindi is a The United Nations Educational, Scientific and Cultural Organization (UNESCO) World Heritage Site. In addition to the Mountain Gorillas living, there are 120 other species of mammals that call this forest home. You will also find there are 348 different kinds of birds, 220 different kinds of butterflies (who knew there were that many?) and 27 species of reptiles and amphibians. That doesn’t even include the trees and plants in the forest either. All in all, it’s a rich, diverse and ever important part of the ecosystem in our world. My trip began flying into Uganda’s capital city of Entebbe where my colleague and I stayed at Boma House to get ready for our adventure. The folks at Boma House were friendly and made our first few nights in the country an easy transition before we flew to Clouds Mountain Gorilla Lodge by way of the town of Kisoro. 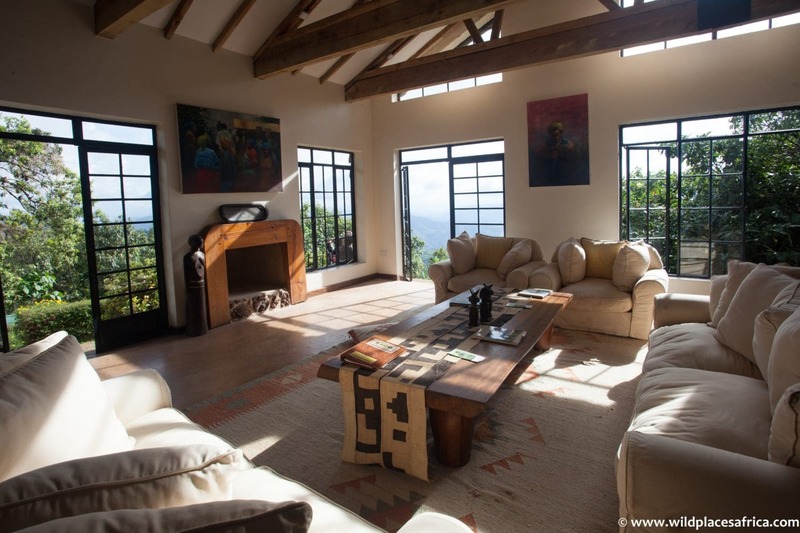 Clouds Mountain Gorilla Lodge is a success in that it is small, but the staff love what they do. It’s apparent that they have a big heart for welcoming guests. You can even see the country of Rwanda in the distance. While you might be wondering how luxurious a Sub-Sahara locale could be? I can promise it’s above expectations. In the evening dinner is served in the small dining room or on the main balcony by candlelight. Moments spent there certainly go beyond the average night at a hotel. 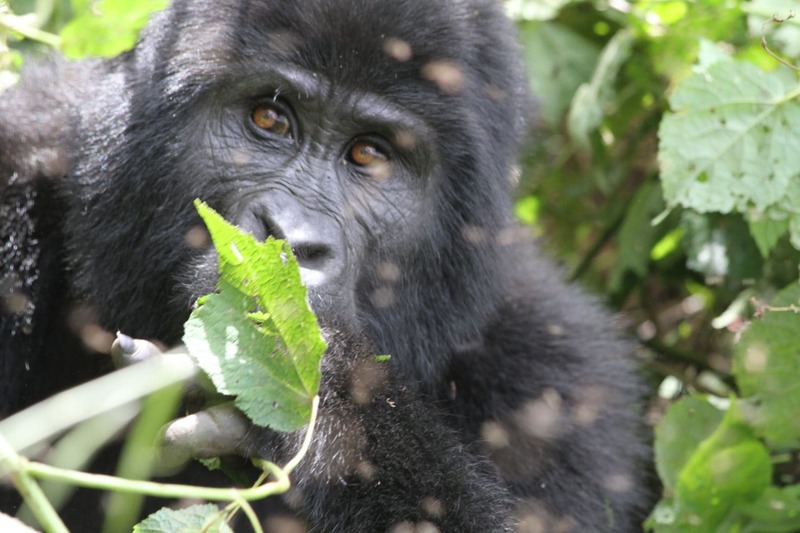 You will only have one day for trekking in to see the Mountain Gorillas. You can also opt to visit the local village and even interact and see the pygmies in the area. Since you don’t want to visit Africa and spend just two or three nights, Journeys Discovering Africa will also set up an additional itinerary for you to visit a game park. In my case I headed to the Serengeti in Tanzania because it was the time of the wildebeest migration, which as most travelers know is a big deal. We were set up at Serengeti Safari Camp. This camp is a semi-nomadic camp situation that on successful years is located right in the heart of the migration of the 2 million wildebeest making their way in this area to the Grumeti River as they have done for hundreds of years. Wildebeest predators also follow the migration in order to eat. So often you will hear lions and hyenas outside the tent camp in the evening. This too is a symphony unlike you are likely to hear elsewhere, an African discovery of all the sounds that make this continent so fresh and unique. I have been to Africa many times, but this was the first trip that while on safari I saw a number of lion prides hanging in the trees. Literally, hanging in the trees. I was told this is not uncommon in this part of Tanzania – it’s quite a regular affair and quite picturesque when you have 10 or 12 lions of all ages staring down at you from their obviously very relaxing perch. As for the camp itself, it’s luxury in the bush. Serengeti Safari Camp has all the comforts of home like hot and cold water, amazing meals and a stout gin and tonic each night before dinner. It’s hard to explain the magnificent African landscape and the feel of being out driving among the wild animals. The words awe-inspiring and humbling come to mind, but it doesn’t come close to capturing the feeling inside. I recommend tents (luxury of course) in the middle of the landscape with a company like Journeys Discovering Africa because you will feel the creature comforts, but still be somewhere that will take your breath away. After we spent a few nights in the nomadic camp we headed for Lemai Serengeti Camp. The lodge is set among the rocks offering sweeping views of the African landscape. The migration is easy to see from Lemai and you can watch as the wildebeest cross the Mara River. I recommend both a tent camp and a lodge because it gives you a good feel for the different means to discover the area while visiting. This was the trip of a lifetime and I say that with complete and utter sincerity. I believe it will change your life as it did mine. It opens up a world and allows one to see these most magnificent creatures. From the Mountain Gorilla to the time spent in the bush using all your senses to gain an understanding of the delicate balance of humans and the many animals who call Earth home. Contact Journeys Discovering Africa at the web site www.journeysdiscoveringafrica.com or enquiries@journeysdiscoveringafrica.com.